Typically, transporting an infant patient from the NICU to the MR unit for imaging provides several logistical challenges to the team caring for and imaging the patient. There may not always be an MR unit close to the NICU. 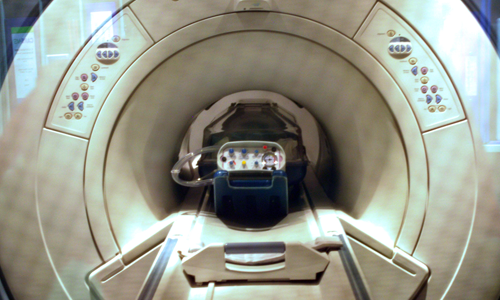 A full MRI compatible transport incubator is expensive, cumbersome and may not be available. A non-MRI compatible incubator is also cumbersome and could pose a safety risk to the patient. Never mind the challenges facing the patient requiring diagnosis. The Scan Pod is designed to be set-up in the NICU where the patient can be moved from their cot, stabilised in the Pod and transported through the hospital to the MR unit in a safe, warm and quiet environment. Then to maintain that same comfortable environment during imaging, and on the trip back to the NICU. The hi-tech composite construction of the Scan Pod has been designed to be both lightweight and shock absorbing, yet contributing no interference or imagine artefacts to MR, CT or X-Ray imaging. Using similar technologies implemented in our ground-breaking Baby Pod II Infant Transport Device, patient safety and comfort are treated with paramount importance. The “head” end of the unit incorporates a section of acoustic damping foam inside the construction of the shell itself to reduce noise and vibration from the MRI environment to maintain patient comfort and reduce stress. Inside the Scan Pod, the infant is comfortably secured in position by a vacuum mattress and soft infant positioning straps. The vacuum mattress is moulded around the patient then the air is removed with the aid of a vacuum pump to hold the mattress in shape. This provides a soft, yet rigid support for the infant during transport through the hospital. The mattress can also be used for any pre-positioning required for imaging, securely and softly holding the patient in the required position. The Scan Pod’s large transparent lid section gives excellent visibility of the infant. The lid is mounted and held in place by easy-secure, easy-release toggles on either side of the unit. The entire lid section is removed for initial positioning of the patient in the Scan Pod and lightweight and easy to remove for further access to the patient if necessary. Direct access to the infant when the lid is secured in place is allowed by either of two large access ports – one on either side of the lid enclosure – to avoid removing the entire lid section for small adjustments. Access ports for ventilator tubing and additional accessory leads are located at the foot end of the Scan Pod near to the ventilator mounting point. The exit port in the unit for MRI coil leads is located at the head end of the unit. The Scan Pod is designed to be a ﬂexible solution for imaging neonates in every environment, accommodating for the requirements of each patient and for each hospital. Our own MR-Neonatal Automatic Transport Ventilator (NeoVent) can be supplied with the Scan Pod to provide MR-conditional oxygen support. 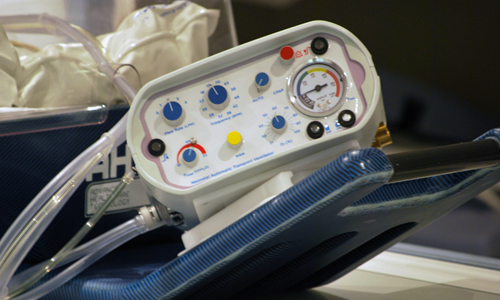 The ventilator mounting point is located at the ‘foot’ end of the Scan Pod unit on the carry board, and allows for the rotation of the ventilator to the best position for easy access. Mounting plates are available for all major current MR ventilators, giving the hospital ﬂexibility to use equipment they already own if required. No ventilator attachments. Only for use within the Hospital.